The definition of Davenport and Short (1990) is also well known. They state that business processes have two important characteristics: First, they have customers who are the recipients of the process’ defined outcomes. Second, business processes normally aren’t just found inside a functional unit, but cross organizational boundaries and occur across or between functional units. 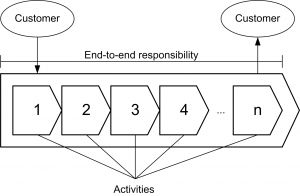 A business process is a sequence of steps which transforms inputs into outputs: It is customer focused, i.e. is activated by market and (external or internal) customer needs, value adding, i.e. creates value which is appreciated by the customer, and has a process owner who has end-to-end responsibility for the whole process. Furthermore it has access to all necessary resources and information (Schantin, 2004).